Harv "Ponderosa" Teitelbaum leans back in his harness, testing his weight against the rope dangling from the tree. He swings his legs forward and braces his feet against the tree trunk. Sliding one hand up after the other, he pulls himself up the rope, feet pushing off one at a time in an exaggerated stepping motion. He scales 80 feet in less than a minute in a practiced dance, becoming a silhouette against the mid-morning sun. A swift foot jab pushes him away from the trunk and swings him sideways. He wraps an arm around the closest branch and in one swift move unclips a folded saw from his harness. A sound like a zipper-scratch drifts to the ground as he begins to methodically cut away dead stubble. The ponderosa looks like a Christmas tree that grew too fast - all trunk with a cluster of branches near the top. Ropes dangle from the branches like leftover garlands. The trunk is pitted with dozens of light-colored scars, the marks of past pruning. "Headache," Teitelbaum shouts, warning those below that another chopped-off branch is on its way down. "Ponderosa" Teitelbaum is an avid tree climber. 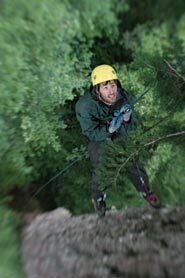 He uses techniques pioneered by rock-climbers, canopy researchers and arborists to climb trees once accessible only to scientists and tree surgeons. Teitelbaum, however, does it just for fun. "It's wonderful to get up there and lose sight of the ground," he says. "In this arboreal world with no sense of the flat ground, everything is vertical, everything is air." Back on the ground, Teitelbaum, a solid man in his 50s with climbing-honed forearms, stands, feet rooted to the spot, meditating on the personalities of trees. "Douglas firs, they're really nice to get all the way to the top," he says. "You can feel it swaying. And cottonwoods have their own personality, solid, even at the top." He smiles as he describes his namesake. "Ponderosas have a lot of character, great smell." He leans in, scratches the bark and inhales the faint vanilla aroma. 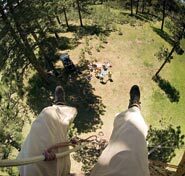 Today, he's climbing "Gus Otis," a ponderosa pine with a base three feet in diameter. The tree is more than 90 feet high, big enough to inspire vertigo, but it's dwarfed by Methuselah, an 1,800-year-old California redwood in San Mateo County. Methuselah is 14 feet in diameter at the base and about as tall as a 20-story building. It's a celebrity in the tree-climbing world: Several YouTube videos have shown folks climbing it. 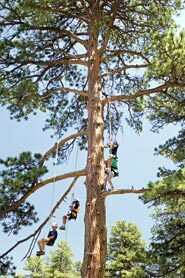 The sport of tree climbing originated in Georgia three decades ago, but only recently became popular in the West. Now, climbing schools are popping up all over the region. Still, tree climbing remains under most people's radar. But if the sport grows at even a fraction of the rate of its older cousins - mountain biking and rock-climbing - forests could soon bend under the weight of thousands of eager climbers. It's a prospect that some find alarming, because just one climber's boot can disturb the delicate ecology of an individual tree. If rock-climbing and mountain biking are any indication, conflicts will sooner or later arise between environmental purists and these new outdoor-fun junkies. The National Park Service has already banned tree climbing, and various cities have put their public trees off-limits. The reaction may seem a bit extreme. After all, national parks and even wilderness areas are, for the most part, open to rock climbers, who swarm the steep faces of Zion, Yosemite and Grand Teton national parks without much restriction. But there's one huge difference between tree climbing and rock climbing: The trees are alive. Peter Jenkins spent his youth in the 1950s and '60s exploring the wilderness and climbing the peaks of Rocky Mountain National Park outside Estes Park, Colo. He easily transferred his mountain-climbing skills to tree trunks, and in 1978, he established a small tree-care business in Atlanta, Ga. "Treeman," as he became known, liked to take his work home with him. He climbed trees for fun, and soon found himself taking his tree-care clients up into the canopy as well. In 1983, Jenkins founded Tree Climbers International Inc. He bought a small plot of land near Atlanta, featuring two stately white oaks, which he named "Diana" and "Nimrod," after the virgin goddess of hunting and the builder of the Tower of Babel. Those two trees have since taught thousands of people how to climb, and what began as a trickle of amateurs spreading their love of the sport through word-of-mouth has blossomed into a nationwide community of tree-climbing enthusiasts.